Baking soda has long been an essential leavening ingredient for baking, but sometimes its high sodium content can be a problem for those who need to restrict their salt consumption. Finding low-sodium substitutions for baking soda without sacrificing leavening can be trickier than it sounds because an obvious choice, baking powder, contains baking soda. With baking powder eliminated there are two other possibilities, potassium bicarbonate or beaten egg whites. The correct substitute for baking soda will depend on the recipe. Baking soda is known chemically as sodium bicarbonate. It's created when carbonic acid mixes with sodium hydroxide to create a white crystalline powder that tastes salty and has the ability to produce gas bubbles when it reacts with an acid. Baking soda typically is used for recipes that have an acidic ingredient such as buttermilk, vinegar, citrus juice, yogurt, sour cream, fruits, cocoa or chocolate, honey or molasses. When added to a batter containing any acidic ingredient, baking soda reacts immediately to create carbon dioxide gas bubbles. It's these gas bubbles that cause bread, cakes and other baked goods to rise. Baking soda's beneficial leavening quality comes at a high cost in sodium. There are 150 milligrams of sodium in 1/8 teaspoon of baking soda. That's almost as much as the human body actually needs in one day, which ranges between 180 and 500 milligrams, according to a study by the Centers for Disease Control. Potassium bicarbonate is probably the better choice of a sodium-free leavener for most baking, especially for quick breads and butter cakes. Potassium bicarbonate will react to acidic ingredients in much the same way as baking soda, so it will produce the carbon dioxide gas necessary to make baked goods rise properly. What's more, potassium bicarbonate can be substituted measure for measure for baking soda, so there are no difficult calculations to make when replacing the ingredient. The other low-sodium substitute for baking soda is beaten egg whites. These are used most often in "foam" cakes such as sponge or angel food that take less flour, sugar and fats. While it's possible to use beaten whole eggs for leavening, separated egg whites work better because of their unique structure of proteins, water and lack of fat. Adding sugar while beating egg whites will help them form stable volume quicker. Additionally, a small amount of cream of tartar, an acidic ingredient, will increase the foaming reaction to provide more leavening. Beaten egg whites must be handled gently, however, because they can quickly lose their air bubbles. 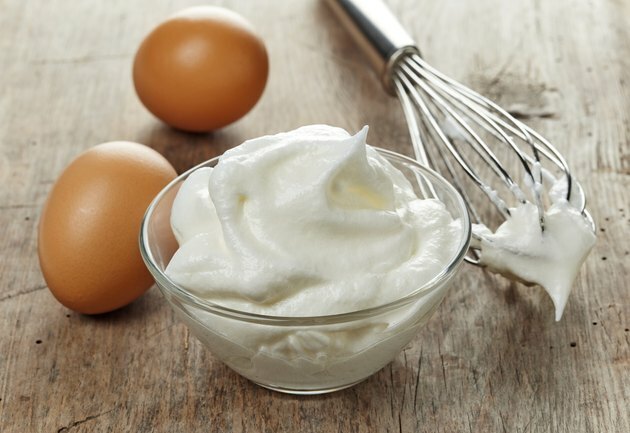 To ensure their leavening ability, beaten egg whites should be folded gently into a batter and not over-mixed.